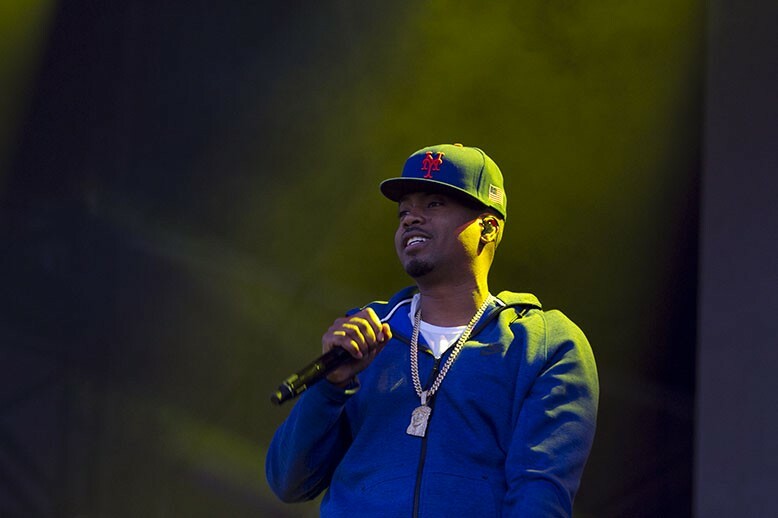 Nas performed songs from his classic album, Illmatic, on the second day of Bay Area Vibez. 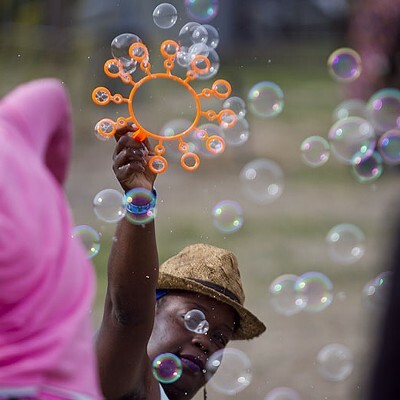 The Bay Area Vibez festival landed at the Port of Oakland this past weekend, bringing world-renowned reggae, electronic, and hip-hop artists to Middle Harbor Shoreline Park — a vast, open space that overlooks the San Francisco skyline. 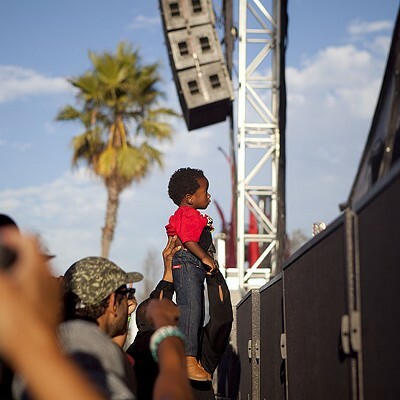 In its first year, the event arrived with a seemingly enormous budget and star-studded lineup that included living legends Stephen Marley, Damian Marley, and Nas. But despite the festival’s grandiosity, the event ultimately felt like a way to capitalize on people’s nostalgia for bygone eras, prioritizing artists who haven’t released new material in years or are descendants of celebrated musicians. And though the name of the event suggested otherwise, the vibes were not very Bay Area at all, with the majority of the musicians coming from other parts of the country and the Caribbean. That in itself is not a problem — but the name of the event came off as empty lip service to hometown pride. This seemed somewhat disingenuous because the event competed directly with Oakland Music Festival, which primarily showcased local talent and took place during the same weekend. However, if you weren’t looking for innovative sounds or up-and-coming, local artists and just wanted feel-good music, Bay Area Vibez certainly was the place. Middle Harbor Shoreline Park provided a gorgeous setting for the event, with the sun setting over the foggy San Francisco skyline on Saturday to a soundtrack of mostly roots reggae. Morgan Heritage, a band composed of five siblings whose father, Denroy Morgan, was a popular reggae artist in the 1980s, performed tracks from its new album, Strictly Roots. 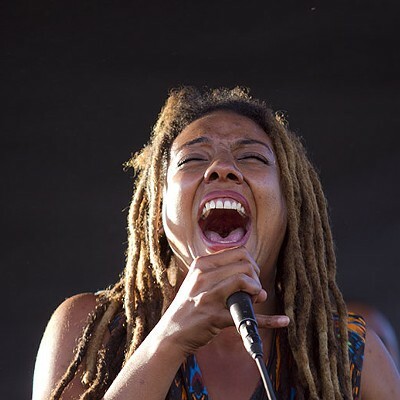 The release mostly follows a traditional, roots reggae template, but occasionally pushes its mellow sound in new directions with the addition of dancehall and R&B vocals. Morgan Heritage’s live set, however, focused on easy listening rather than spontaneity. The musicians are undeniably skilled and delivered produced-sounding, studio-quality versions of their tracks, but their set flatlined at an even tempo and prominently featured smooth jazz saxophone that easily faded into the background. As clouds of weed smoke filled the sky, Saturday ended with sets by Stephen Marley and Damian Marley. Stephen Marley is a talented vocalist — with a soft yet raspy voice and a wide range — and six-time Grammy winner. But he hasn’t released new material in four years and filled his performance with Bob Marley covers, leaving original songs wanting. One of his set’s stand-out moments was when he brought out Skip Marley, his nephew and Bob Marley’s grandson, to the stage. Skip Marley played his single “Cry to Me,” a slow, somber reggae song with a sparse beat that works well with his warm, emotive timbre and sentimental lyrics. His brief performance demonstrated his ability to carve out his own lane while continuing family tradition. 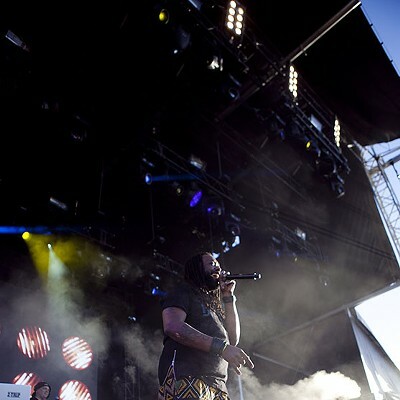 While Stephen Marley’s set focused on his father’s legacy, Damian Marley, who closed out the day’s performances, proved to be more forward-thinking in his approach. He energized the crowd with his rapid-fire vocals, which fuse roots reggae and dancehall singing with flows that often evoke hip-hop. Though it was somewhat disappointing that Damian Marley did not play with Nas — his one-time collaborator who headlined the next day — Stephen Marley joined him on stage for several heartwarming duets. 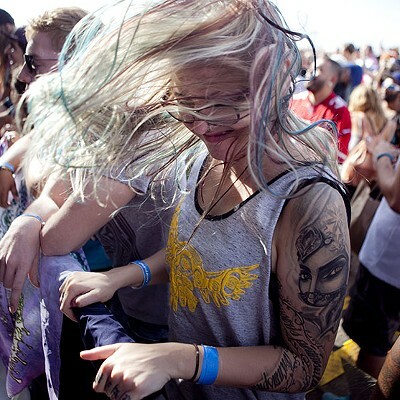 Sunday’s lineup departed from Saturday’s more traditional offerings, with a heavier emphasis on dubstep and hip-hop — but especially dubstep. 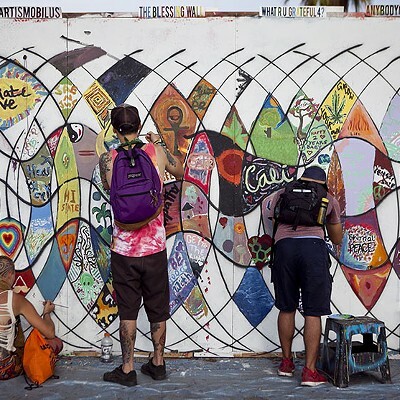 While the first day of the festival attracted a more diverse and inter-generational crowd, the second day drew mostly Burning Man types. Cultural appropriation was rampant, and there were frequent sightings of white people sporting dreadlocks, bindis, Navajo print, etc. Unfortunately, some of Sunday’s most memorable, yet lesser-known artists were relegated to the festival’s smaller stage and their set times competed with more famous acts, so they didn’t get their proper shine. Kev Choice Ensemble, a group led by the local rapper and virtuosic pianist, dazzled a small, enthusiastic crowd with its skilled musicianship. Choice rhymed while playing complex keyboard melodies, occasionally drifting off into elaborate solos that showcased his classical training. 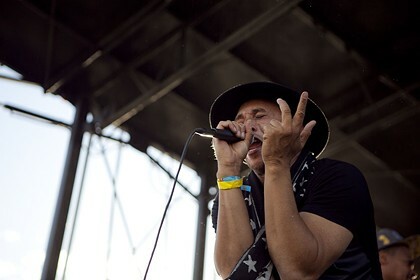 He brought out guest artists such as singer Jennifer Johns, whose breathy, soulful vocals were impressive, and San Francisco rapper Sellassie. Their show ended with an improvised cypher that attested to the musicians’ synergy. 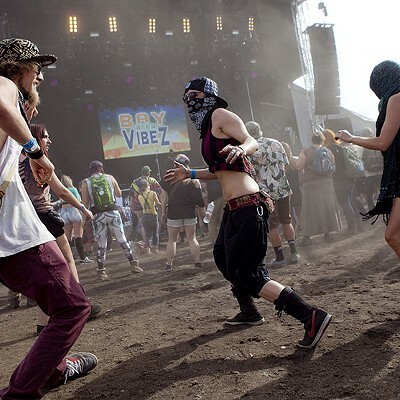 Meanwhile, most festivalgoers were dancing to dubstep producer Z-Trip — whose barrage of bass emanated from the other side of the field — and missed the show. 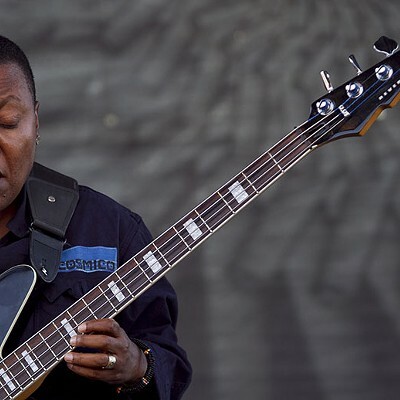 Meshell Ndegeocello, a talented bassist and bandleader with dynamic vocal ability, didn’t get her due recognition either because, as her set began on the smaller stage, Nas started to perform on the main one. Ndegeocello was one of the only female musicians in the lineup and was a major influence on the neo-soul movement of the late Nineties and early Aughts. She opened her set with a sparse, bass-driven cover of Ready for the World’s Eighties R&B hit “Love You Down,” which highlighted her smooth, husky vocals. But it became difficult to hold the audience’s attention when Nas, one of the only Nineties New York rap legends who still performs today, began his set when she was only a few songs in. Nas rapped with impeccable dexterity and his performance, much like that of the Marleys the night before, invited the audience to time travel to his heyday. The majority of his set list came from his 1994 album Illmatic, which is still considered one of the all-time greatest hip-hop albums. Illmatic’s success overshadowed Nas’ subsequent releases in the late Nineties and early Aughts, and though Nas has performed its songs hundreds of times over at this point, he still delivered an invigorated performance that attested to the record’s timelessness. Bassnectar closed out Sunday night’s show, and it was somewhat surprising that festival organizers prioritized the veteran DJ and producer over Nas in the set time hierarchy. Bassnectar synced up his blaring, wobbly dubstep beats with frenetic video projections that made for a dizzying audio-visual experience. 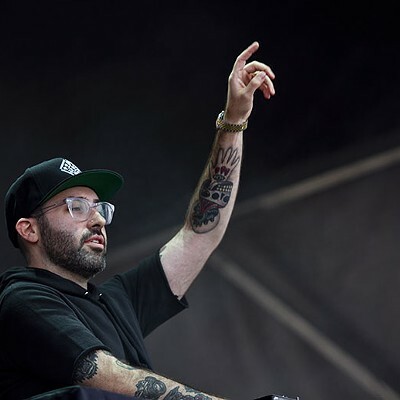 However, after about twenty minutes of his lengthy set, his pattern of slow-paced breakdowns, build-ups, and massive bass drops became predictable. Watching the lunar eclipse taking place that night from the park’s marshy beach proved to be a welcome respite from the sensory overload taking place on stage. A revealing Q&A with the hyphy icon and philanthropist. Listen to Ah Mer Ah Su's Dreamy, Downcast Ballad "Klonopin"